Sarah Ferguson wore our lovely Aruna Seth Ameroni black suede court shoes to a charity evening for Great Ormond hospital this week. 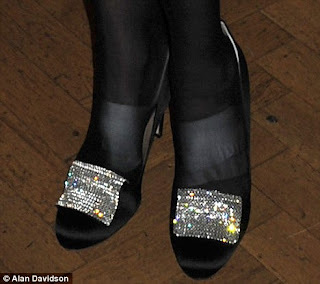 Looking absolutely dashing in our heels the Daily Mail pointed out her feet were both protected with bandages. According to a spokesman, Prince Andrew’s former wife recently twisted her ankle and her specialist advised her to have both feet bandaged so 'one doesn’t over-compensate for the other’.